Many analysts, including EIA and ACEEE, are attributing the change in part to energy efficiency, including federal and state product efficiency standards, state and local building codes, and efficiency programs operated by utilities and others. Annual differences in weather and changes in the structure of the economy (e.g., more services, less heavy manufacturing) probably also play a role. Also, it should be noted that there are regional differences. In recent years, electricity use has generally declined a little in the Northeast and grown somewhat in the South; other regions have tended to be stable. Source: Energy Information Administration, Monthly Energy Review. 2015 GDP from Bureau of Economic Analysis. While crystal balls are murky, there is a good chance this trend will continue as many factors are driving use down and only a few factors are driving it up. 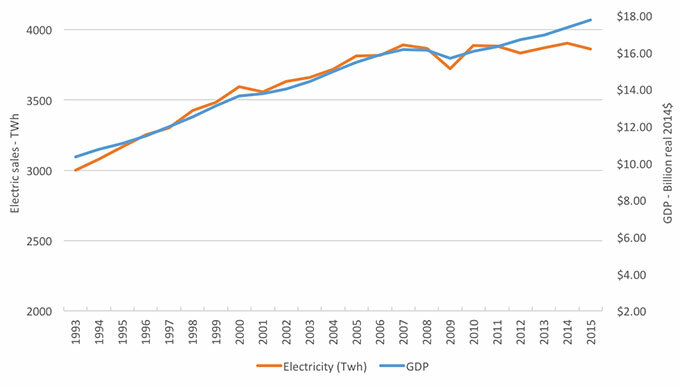 Factors pushing use down include continued energy efficiency efforts, continued changes in the economy, reduced space heating use due to gradually warming weather and southward population shifts, and likely continued growth in solar and other distributed generation (the graph only includes power used and sold by utilities). Factors that could drive electricity use up include growth in electric vehicles, rising air conditioning use due to warmer weather and southward population shifts, and installation of air conditioning in more northern homes. Flat electricity growth has important implications for utility system planning. It means that new generation is only needed to replace retiring plants or to replace existing but more expensive plants, allowing the more expensive plants to operate less or even retire. It also means that utility revenues increase only to the extent that rates go up or utilities identify new value-added services to sell. The days when utilities can expect to grow by increasing sales may be over.